Lionery to us arrived on 11th of March and purchased Golden Stage listing. For now Project is online almost 10 days and I reinvested $400 into it. Project in this short time have gained popularity and good references from investors. 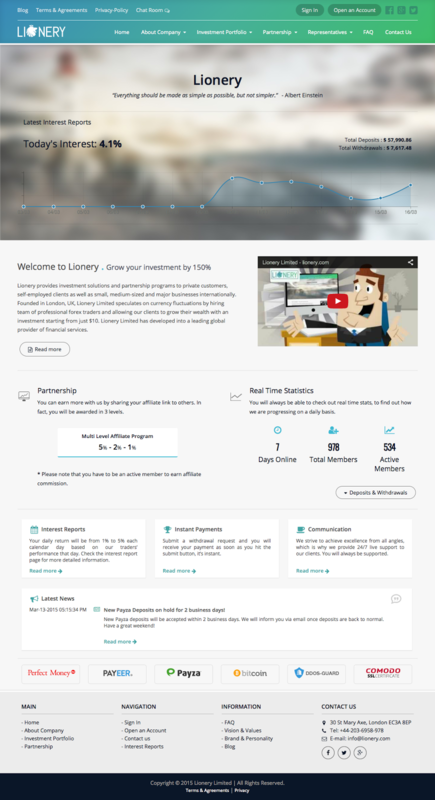 Project Lionery is modern investment platform where in my mind only one thing is missing – responsive design. Despite that administrator of Lionery have chose right colors, interesting title and packed webpage with lot of information. It is also nice to see well made animated video presentation about this project what will make happy newbie investors and will make good overall impression of this project (although similar videos I have seen also for some other investment projects). At the first sight Lionery reminded me one of the top projects of previous year – Leancy. Yes, even title is similar and when it comes to investment plan it is similar as well. Surely behind this project is different administrator because Lionery does not use custom script but behind this project is GoldCoders script that is like a “golden standard” in HYIP industry. In my mind idea of Lionery from administrator is just great because he has taken an example from one of the best projects and that is why this project leaves good first impression. This might be the thing why this project is growing that fast and I must say that mostly all of investors like this project. Second thing why I think that another administrator operates Lionery is because of advertising strategy. Leancy administrator did not purchase monitors at all, I made my personal investment at that time and I made good profit with Leancy project. As I see for now Lionery administrator have added few monitors and I think that in future this project have all the chances to grow this project bigger because there is space for some other monitors. Also I hope that administration will advertise somewhere outside regular HYIP investor cycle to attract bigger amount of investors. One more thing – I see that administration of Lionery have made social media accounts but still administration does not use almost any potential from them, so also there is space to grow this project bigger and bigger. As I said earlier Lionery uses so called “Leancy investment plan” where you receive floating daily interest until you reach 150% return. It is very simple investment plan, you can invest starting from $10 and project will pay you starting from 1% up to 5% daily until you will reach your 150% return. Same rules for every investor. How long that will take to reach 150% return? Judging from previous interest it will take something like 45 days, maybe less, maybe more. Basically that is all about investment plan from Lionery and it does not offer any additional extras like “compounding” or something else what just great. Project accepts all the most popular payment options of HYIP world – Perfect Money, Payza, Payeer and cryptocurrency Bitcoin (with real-time Bitcoin to USD exchange rate). Deposits as well as withdrawals will be processed at the moment and you will not need to wait. I know how much everyone loves instant payments and that is feature what you will love from Lionery project. I already mentioned earlier - project is using GoldCoders HYIP script on what is Lionery project based, and I can say that this script for now is the most reliable choice when it comes to HYIP projects. GoldCoders is proven to be number one choice when it comes to HYIP scripts for years. Also when it comes to hosting and DDoS protection Lionery does not cut the corners and have chose the best provider - DDoS Guard. Additionally project is secured with “Green bar” SSL encryption what will make your connection safer but domain name is prepaid just for one year (short period of time, but for HYIP maybe it is just normal). In summary, I can say that if administrator will play cards right than project have huge potential. On the other hand lets remember that if we make something similar than in many cases we can’t guarantee same success as ancestor did. Of course lets believe for the best and if you invest than invest only what you can afford to lose. LInonery has been a very impressive program so far. It's nice to see the ROI has been been higher than many expected each day. I'm impressed with the fact that today's ROI is 3.7%. Today is a holiday. Good Friday. Some other programs are not paying any ROI at all today. Hopefully Lionery will be here for many months to come. The amount of 1.2 USD has been deposited to your Perfect Money account. Accounts: U7366954->U133***. Memo: API Payment. Withdraw to SleduiZaMnoicom from Lionery Limited.. Date: 13:06 23.04.15. Batch: 87656159. Over at Moon Bitcoin you can get faucet bitcoins. 163 satoshis every 1 hour.